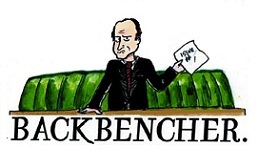 The Backbencher – Nobody’s a winner! It doesn’t take much to realise that using taxpayers’ money to raise the price of food is bad economics. 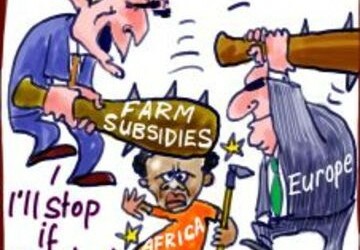 Yet this is precisely the premise of the Common Agricultural Policy, a system of subsidies that was first implemented by the European Union in 1962. Through the CAP, the EU manages to amplify poverty in developing countries, crush smaller EU farmers, and still have enough benevolent socialist fervour to create vast oversupplies of wine, sufficient to fill hundreds of Olympic-sized swimming pools. Many struggle to believe that such an absurd scheme exists in the 21st Century. The explanation is relatively simple; the tariffs placed upon agricultural produce from developing countries exacerbate poverty by reducing their export revenues. Furthermore, a distinctly corporatist ethos pervades the EU, with the majority of subsidies going to the largest farms: the biggest 25% of agricultural firms receive around three-quarters of all support. Britain also gets a disproportionately small amount back from the CAP, with Germany’s similarly sized agricultural sector receiving around 40% more grants than our own. When speaking to Agence France-Presse, Hans-Dieter Gabel (president of a prominent German agricultural collective) argued that the ‘real winners [of the CAP] are the consumers’. Yet when coupled with punitive tariffs that raise food prices, the ludicrous use of taxpayers’ money to subsidise the bloated European agriculture market costs the United Kingdom approximately £10 billion a year. To put that figure in context, the average cost per household comes in at £7.65 per week in family food bills. As Daniel Hannan has pointed out, there are only two Marxist agricultural systems left in the world: the collectivist farms of North Korea, and the Common Agricultural Policy. Just as the innumerable crises that continue to plague North Korean farming are representative of the failures of price-fixing and tariffs, the EU’s own shambolic efforts to distort the market should also be viewed in a markedly unfavourable light. Protectionism is an outdated relic of the socialist fallacy that wealth is gained by resisting imports. 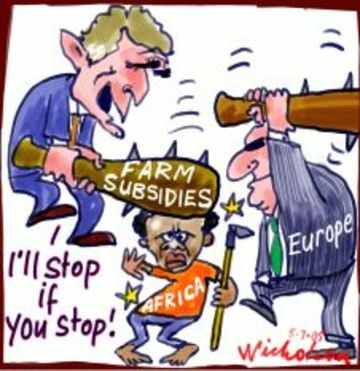 ‘Fortress Europe’ helps neither the taxpayers that prop it up, nor the agricultural firms that become dependent on subsidies to survive. But perhaps worst of all, it disadvantages farmers in the developing world who are left unable to create wealth by selling their produce to European consumers, instead being priced out of the market by unfair EU practices.